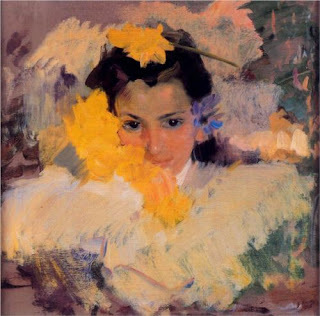 "to write from any one of Sorolla's paintings, employing their favorite of the many short forms"
The last line takes your description to the artistic level. Lovely impression of the painting. Yes, her eyes really do seem to be speaking--an elegant yet simple response in one of my favorite forms. Thanks for participating. She does have eyes full of promise and beguiling! Well done. I was fascinated by this painting, but didn't know why. Of course, you're right, her eyes are so expressive. I had to choose others because I couldn't decipher this one, but you've done it perfectly. Yes, the look of enchantment n' wonder! You SO caught her expression in words. Lovely. beguile... yes, that does so fit this painting. Captivating - eyes and words. Well, those eyes are intriguing...inviting.